It’s no secret that I love a good recipe challenge. Bob’s Red Mill challenged me to come up with a recipe to go with freekeh, the latest addition to their Ancient Grains line. I’m glad they did, because now I have a new favorite quick-cooking grain in my pantry. I’d honestly poked fun of funny-sounding “freekeh” before I tasted it myself, in part because it conjured up memories of the rap songs playing at parties during my early college years. Ah, freekeh freekeh! Sorry. As it turns out, freekeh is not a lyric from rap songs, nor is it bland hippie food. Sorry again. Freekeh is a flavorful strain of ancient wheat with a nutty, slightly smoky flavor and a pleasantly chewy, couscous-like texture. Bonus? Cracked freekeh cooks up in 25 minutes, so it requires less than half the time of wheat berries or other whole grains. Cooked freekeh goes great with Mediterranean flavors. I combined it with roasted cauliflower, creamy tahini sauce and fresh herbs to make this delicious whole-grain meal. While the grain is new to me, freekeh is actually one of the oldest grains out there. Freekeh is young, green wheat that has been roasted and cooked in the Middle East for about 2000 years. Since freekeh is a strain of wheat, it’s not gluten free, but it is highly nutritious. It’s rich in protein, iron and above all, fiber. The fiber content is no joke. Freekeh has twice as much fiber as quinoa and it keeps me feeling full for hours and hours. I wasn’t hungry for breakfast after my dinner of roasted cauliflower and freekeh the evening before. I’ve found two slightly different cooking methods that produce different textures. For a fluffier, more separated, couscous-like texture, cook the freekeh just until tender, then drain off any liquid and let it steam in the pot, covered, for 5 minutes, before fluffing it with a fork. If you want a more creamy, borderline risotto-like texture, cook the freekeh until it has absorbed all of the moisture in the pot. 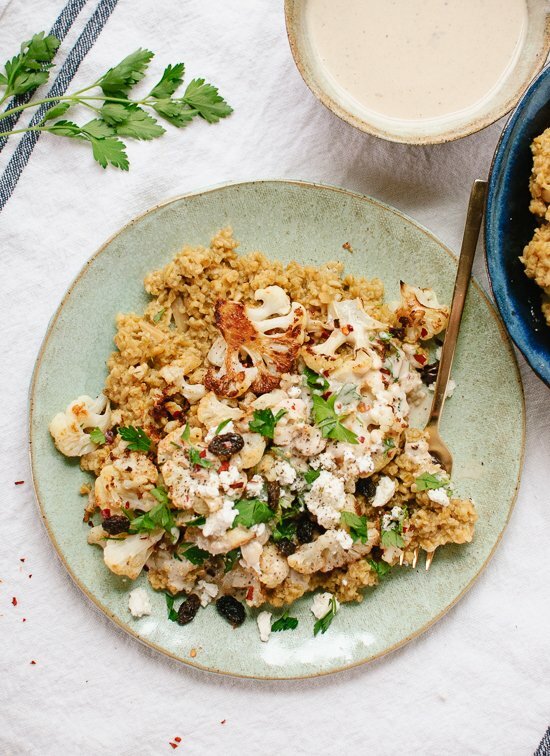 I decided to stay true to freekeh’s Middle Eastern roots with this cauliflower and tahini dish. I found a freekeh pilaf recipe on the back of the freekeh package, and it reminded me of an amazing rice pilaf I tried in Israel, so I used that as the base of the dish. I altered the method to produce a fluffier texture, which contrasts nicely with the creamy sauce. 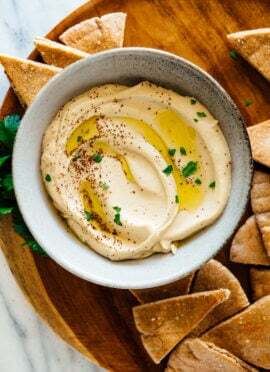 I’ve been obsessed with the combination of creamy, nutty tahini with caramelized cauliflower ever since I tried a cauliflower pita sandwich at a local Mediterranean restaurant earlier this year. The complete dish is my new favorite comfort meal. It’s healthy, wholesome but above all, outrageously delicious—making it pretty much perfect for post-holiday consumption. One last note before I go. Freekeh is rather new to the scene, so you might have better luck finding it online than in your local grocery store just yet. You can buy it directly through Bob’s Red Mill over here. Or in the meantime, feel free to substitute another whole grain that you have in your pantry. I think whole wheat couscous, farro, quinoa or barley would go great here. You’ll just need to adjust the amount of liquid and cooking time accordingly. Healthy Middle Eastern-inspired meal featuring roasted cauliflower, cracked freekeh, garlicky tahini sauce, fresh parsley and raisins. Easily made vegan. Recipe yields two large servings or up to four smaller servings. To cook the freekeh: Warm 1 tablespoon olive oil in a heavy-bottomed saucepan. Add the almonds and cook, stirring occasionally, until they’re fragrant and turning golden on the edges, about 3 minutes. Add the freekeh and sauté for 2 minutes, then add the garlic, cumin, coriander and salt, and sauté for 1 more minute. Add vegetable broth, raise the heat and bring the mixture a boil, then reduce heat to medium-low, cover and cook, stirring occasionally and reducing heat as necessary to maintain a gentle simmer, until freekeh is tender to the bite, 20 to 25 minutes. Drain off any excess liquid, cover and set aside for 5 minutes. Fluff with a fork and season with salt and pepper to taste. To make the dressing: In a bowl, stir together the tahini, lemon juice, garlic and red pepper flakes. Whisk in the water until you have a smooth, blended tahini sauce. Season generously with salt (I added about ¼ teaspoon) and black pepper, to taste. To assemble the individual dishes: Start with a bed of cooked freekeh and top with roasted cauliflower. Drizzle tahini sauce generously over the dish and then top with a sprinkling of chopped fresh herbs, crumbled feta (optional), raisins and sesame seeds. Serve immediately. Leftovers are best stored as individual components and assembled after reheating the freekeh and cauliflower. Recipe adapted from Bob’s Red Mill’s freekeh pilaf (found on back of freekeh bag) and my tahini dressing. Leftovers? Leftover tahini sauce makes a great dressing for greens. Actually, any leftover components would go great in a green salad. *Freekeh substitutions If you can’t find freekeh, substitute your whole grain of choice for the freekeh, adjusting vegetable broth and cooking time as necessary. Farro, barley, whole wheat couscous or quinoa would make great substitutes for the freekeh. Make it gluten free: Substitute quinoa for the freekeh, adjusting the amount of liquid (vegetable broth and/or water) and cooking time accordingly. Make it vegan/dairy free: Skip the feta. Disclaimer: This post is sponsored by Bob’s Red Mill and I received compensation for my participation. Opinions are my own, always. Thank you for supporting the sponsors who support C+K! I have never had freekeh before, but it looks like it would be delicious. Combined with tahini, you can’t go wrong :) I work in a natural foods store and we sell a lot of Bob’s Red Mill products, so I have to order some freekeh. Thanks, Kristie! Definitely keep an eye out for freekeh, I really love it! This looks incredible! I love Middle Eastern flavors, so I’ll have to try this out soon! Roasted cauliflower is the best, love the tahini sauce! P.S. I was thinking the song you were referring to was Run DMC but then I realized the lyrics to that song are “it’s tricky” not freaky. Haha. That sounds like an awesome winter salad! 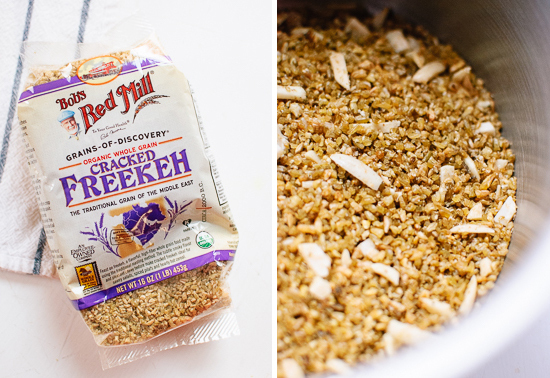 Love the name freekeh…such a fun grain! I’ve never heard of freekeh before (what a funny name for a grain). But I’m definitely inspired to try it out. And yeah… can’t go wrong with roasted cauliflower and tahini sauce. every time i see ‘freekeh’ i think of that song, too… ah! i like what you came up with. i’m sensitive to wheat so i think i’d opt for millet or sorghum in place of the freekeh, but i’m all about your flavor pairings here. simple and good. i love your style! Thanks, Jaime! I bet either would go great with this dish (I’d probably go with sorghum!). Enjoy! Such a fun baking challenge! And this looks awesome! MmMmmM, this looks so delicious! Looks delicious, Kate! I’ve never tried (or heard of!) freekeh before. But tahini dressing is always good in my book! By the way, BHPhoto is having some major cyber Monday deals, if you want to get any equipment for starting to do videos. That’s where I purchased my camera from and they were wonderful (customer service is awesome!). Just thought I’d let you know! I’m uploading new videos 5 days a week starting tomorrow-Christmas and I might be grabbing a new lens on Monday to take advantage of the deals (+get some cool bokeh light effects from the Christmas decorations!). Thanks, Ella! I checked out BH’s deals but I’m still holding out for a new Canon camera with video. Just can’t decide if I should buy one now or wait and see if they come out with a new model in a few months! Looks delicious, Kate! I’ve been meaning to try freekah for a while now, but just haven’t gotten around to it. But I am certainly motivated now. Can’t wait to try out this salad! I had to check out the “freekah” when I saw this post. Now I will need to go back to my 70’s roots and get my “freekah” on! But first I’ll try this recipe with quinoa, because I’m dying to try some of that garlicky tahini sauce. This recipe sounds sooooo good! Haha! Hope you enjoyed the cauliflower with quinoa, Sandy. Killing me here! and to think I just picked up a ginormous head of cauliflower tonight…meant to be. Not gonna like; I’m probably going to have to do this with miso. Just gotta. Hope you loved this dish, Jen! Miso sounds like a very good idea to me. This looks yummy! Roasting is my favorite way of cooking cauliflower. And I’ve never seen Freekeh here in Switzerland, but fortunately, I found some in Canada this summer. So making this for dinner! Awesome! Hope you enjoyed it! This looks so yummy and unique! Love the idea of tahini sauce! This looks like a couscous bowl that I make when I need a break from heavier food. Couscous, roasted vegetables and a lemon-tahini sauce. Can’t wait to try it with Freekah! Oh, your couscous bowl sounds great! Thanks, Alex. If I don’t eat this ASAP I might die!! 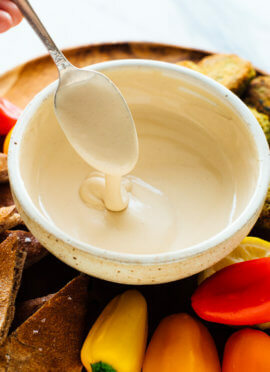 Absolutely love tahini sauce… thanks for sharing this unique recipe! This sounds amazing! I already make a roasted Cauli with tahini dressing dish, which gets gobbled up, but hadn’t thought to serve with a pilaf. SO excited by this idea. Thanks, Louise! 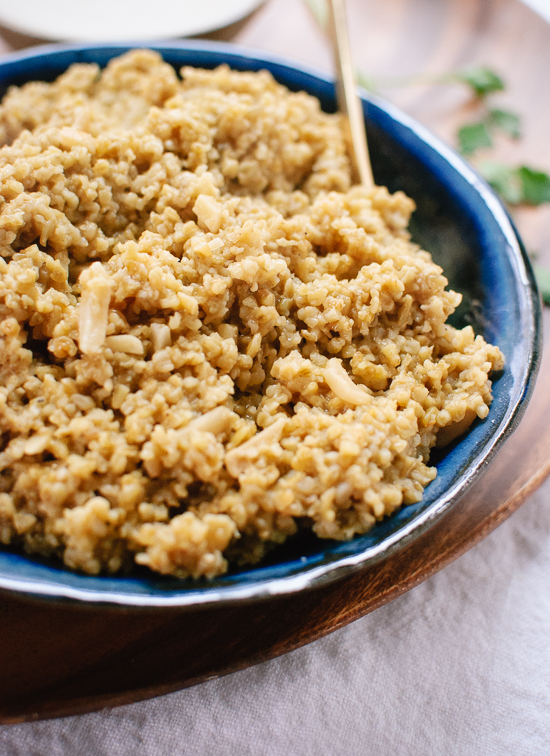 I love any combination of cauliflower and tahini, but it’s really great on pilaf! Enjoy! Just made this for my family. My 16 y.o. vegetarian daughter pointed out the recipe. It is absolutely delicious!!! Really satisfying, without all the guilt of a heavy meal. We loved it and will be adding it to our regular favorites. Super easy too!! This is a must make!! Sheila, so glad to hear that you all enjoyed the dish! 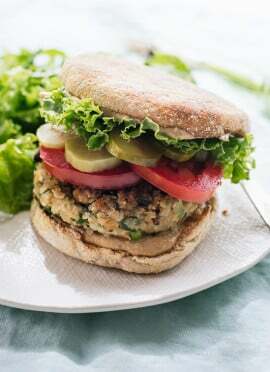 I love it, too—it’s comforting and creamy, but full of veggies and whole grains. Thank you for commenting! I’ve never tried freekeh before, but I have been meaning to for the longest time! This recipe will definitely get me going! I seriously love everything about this dish! You’ve got me craving some Middle Eastern flavors in a serious way. I couldn’t find freekeh at the store, so I made it with farro instead. It’s now one of my new favorite dishes! Thank you for creating it! Wonderful! Thanks, Ashley, I’m glad to hear it! I LOVE your food site!! I am always excited when I open my emails and see that you have posted. The recipe today looks amazing! I have some freekeh, but haven’t tried it yet. And, I have some cauliflower in the fridge! Yeah! I have been wanting to tell you that I love greens, but especially Kale. I get a big bunch of kale, clean it and take out the tough ribs. Then I steam it just for a few minutes. I let it cool and then put in a plastic bag, flattened down, and throw it in the freezer. I use this on everything….pizza, in soup, and so many other things. It is so easy to pull out of the freezer and break a piece off and then chop it a bit depending on how I am using it. I love it for the taste, but, also for the awesome color it adds to the dish. Keep on posting, your ideas are wonderful. Denise, thank you! I’m delighted to hear that you’ve been enjoying my recipes. I love your kale prep idea, will have to try that soon! Thanks for sharing and happy holidays! Oh WOW. This looks absolutely delicious – I LOVE roasted cauliflower! I don’t think I’ve ever tried freekeh but you’ve made it look so good! I made this for dinner tonight and it was amazing!! Had to substitute the freekeh with quinoa since it wasn’t available at my grocery store. The roasted cauliflower was perfect with the garlicky tahnini sauce and feta. Everything about this recipe was delicious, and I will definitely be having it again. Thanks for another “10/10 will make again” Kate! Made this for dinner tonight and HOLY COW is it amazing! The flavors all go together so well – this is a masterpiece! I subbed out couscous for the freekeh – it was delicious (and fast, too). Thanks for a great recipe! Thanks, Rachel! So glad it turned out great! Unfortunately I couldn’t find Freekeh so I combined quinoa and barley which was super yummy. Thanks, Lisa! So glad you both enjoyed it. Hi Kate – i actually subsituted course bulgar – it actually looks similar! I have been looking at ways to use it – i tried it once in salad but i guess i did not wash it enough bc there was lots of stones. I will have to give it another shot. I will be trying this tonight – thanks! Ironically enough – i live in the middle east and can find Freekheh – but my carrefore was sold out. So i will be using coarse bulgar – it looks similar – hopefully it tastes great! Oh, that’s funny. Hope this dish turned out great for you, Penny! This was great, and a little different from anything I’ve had before. Thank you for sharing. We’ve made this a few times now and have switched the freekeh for any plain grain we have left over (cooked with the spices). We’ve topped it with toasted almonds and yellow raisins in addition to the vegetables and sauce. This makes an for an easy to-go lunch too – one that does not disappoint..! Thank you, Linn! So glad you’re enjoying this dish. I love the way you have adapted it to work with a variety of grains! This made a great vegan meal. I bought a (large) bag of freekeh from Costco and had no idea what to do with it. I was just adding about 1/4 cup in with rice to serve with dishes, but this pilaf was so good. The tahini dressing turned out watery for me, but I added a bit more tahini and about two teaspoons more lemon juice and it turned out great. Also added some pan fried tofu, chickpeas and kale to the dish for additional protein! Thanks, Haley! I love freekeh and hope you do, too, now! Your tahini might have been thinner than mine to begin with. I’m glad you remedied the situation! If your city has any middle eastern grocery stores, you can likely find freekeh there. I went into one in Denver today and they had it. Thank you, Sarah! So glad you enjoyed it. Great idea to roast the leaves, too, I’ll have to try that! Thanks, Dani! So glad your dish turned out well for the BBQ. I get nervous when I cook for other people! Not quite sure how this recipe got 5 stars… I wanted to love it, and I was looking so forward to it, but the sauce just ruined it. Sauce was so gross. Maybe without the sauce it would be fine, but cost me an arm and a leg to make sure I had all these ingredients, and to spend an hr in the kitchen, then for it to turn out less than amazing… I was disappointed. Robin, I’m so bummed you didn’t enjoy the sauce. Maybe your tahini has gone bad, or it’s just not for you? I absolutely loved it and the other reviewers have, too. I’m typing this as I’m eating – this recipe is DANG good. I added some chipotle pepper to the tahini sauce. Delicious. Yum! Just finished eating this, and it was so good! I was slightly concerned two cloves of raw garlic in the tahini would be too much (I’m always wary of too much raw garlic) but it was perfect! Thanks, Erika! Happy to hear it! I have been trying to find a good recipe for freekah (and have had some questionable ones)…this was AMAZING! 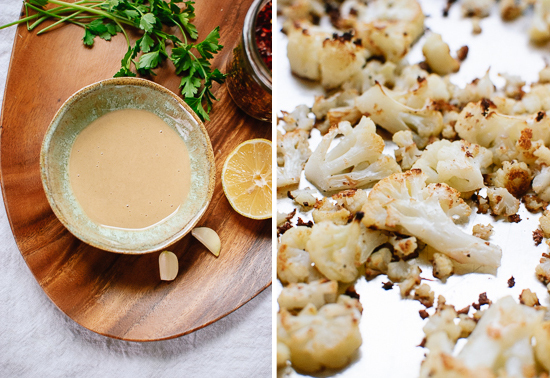 I loved the combo of cauliflower, smoky freekah and garlicky tahini. I’ve already shared with friends!!! This is delicious!! I made a couple changes because my wife is allergic to nuts and we are both gluten free. I subbed sunflower seeds for almonds and used quinoa for the grain. I used a salted veg broth so for that reason did not add salt to the pilaf. Also skipped all the toppings and it was great as is! We ate it with falafel for some extra protein. Very satisfying meal that I will make again!! Thank you! Thank you, Rachel! Glad you enjoyed it! Kate you are inspirational! A friend introduced me to freekeh about a month ago, and I have since cooked it for about three other dinner parties. This evening I have just made your cauliflower and tahini recipe for a vegetarian friend of mine, who has travelled widely and has enjoyed more ethnic food than I can imagine, but she said this is possibly one of the best ever things that she has eaten! Naturally I was flattered, but it was of course your easy to follow recipe that had such delicious flavours going on. I will definitely be making this again, just as you have written it. Wow, thank you, Chippy! That’s quite a compliment. I’m so glad it was a hit with your friend! Thanks for letting me know! This was amazing! Everyone loved it. Will definitely be making this again! Hooray! Thanks for letting me know, Valerie! This recipe was fantastic. Even with the omission of raisins, feta, and sesame seeds, the dish was zingy from the lemon and very hearty due to the delicious freekah. Next time I make, I’ll add some currants and perhaps a bit of orange zest. Thanks for sharing! Will be making over and over again. Thank you, Connie! Glad you enjoyed it! I have found Freekeh at a local Middle Eastern market here in SoCal. Made the recipe using quinoa. The roasted cauliflower tahini sauce combination is phenomenal! Love this recipe. Will definitely make again in the near future. Been making this with quinoa…so good!!! I tried this recipe out expecting it to be healthy but not super tasty. It was amazing! The almonds worked perfectly with the rice (I subbed basmati rice because I couldn’t find freekeh) and the cauliflower tasted delicious. The tahini sauce was sour in a good way, and went great with the rest of the meal. The recipe wasn’t too challenging and my (non-vegan) family enjoyed it. Will definitely be making this again! Wow! This was amazing! I will make this again and again! PS. Also, this recipe is one of my favorites! I just made this and LOVE it. This recipe is incredible! Half of our family grumbles about vegan meals tasting bland. This dish is packed with deliciousness! Nobody complained last night. It is very filling as well. The sauce could easily be enjoyed on any other whole grain. We bought the freekeh at Sam’s Club but I have seen it at Sprouts, Whole Foods, and Trader Joes, as well as Amazon.com. We divided the recipe into 6 decent sized portions, however 4 would be plenty for main dish sized meals. The freekeh expanded enormously so one purchased package will make many many meals. I will definitely make this again! I couldn’t find tahini at my local grocery (!) so I made up a fake one, combining plain yogourt and goma sauce, and I think it made up for it pretty well. My version was over couscous. Front there I went along the recipe, and adding a few fresh cherry tomato hand picked from the garden. This recipe is now on top on my list ! Thank you so much ! Sound yummy. My freekeh was given to me by a friend who didn’t like it and the grains look mostly whole. The package is mostly in Arabic and only says cook until done in English. Can I use it and how should I modify the cooking time or recipe to compensate? We absolutely love this recipe. If you closed your eyes while eating it, you would swear there was meat in it. We love adding the crumbled feta cheese and some raisins before drizzling the tahini sauce on it. I’ve made this twice now and the only suggestion I would offer is to roast more cauliflower as there never seems to be enough to go around. As cracked freekeh is expensive, we actually ordered a large organic bag of it online and froze it in smaller bags. Company is out of Minneapolis but product shipped from California. This is freekeh delish! I especially loved the tangy tahini sauce. The only problem is there aren’t any leftovers for tomorrow’s lunch…the two of us polished off the entire recipe. I will definately make this again. OMG!!! This was amazing! My son and I absolutely loved this dish! The only thing I did different was use Quinoa because I couldn’t find the Freekeh. I can’t wait to make this for my sister and family when they come visit in a month! Quinoa sounds like a delicious substitute, Julie. I hope your family likes it, too! So good! I’m not vegan but there is so much flavor you don’t really need cheese. Used dried cranberries and homemade tahini to make garlicky sauce. Yum. I found your website purely by accident today as I was searching the internet for a vegetarian dinner option. 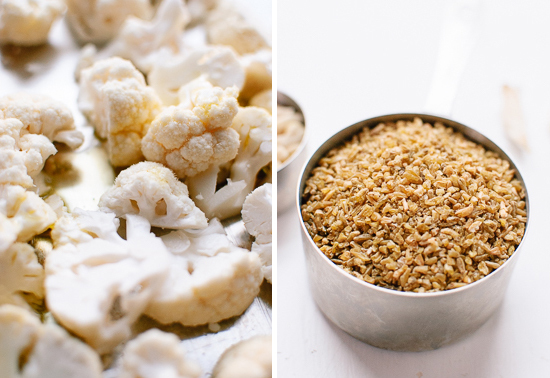 I ended up making your cauliflower and freekeh bowl….OMG! Absolutely fabulous! My husband loved it too. I can’t wait to try some of your other recipes…thank you so much for your beautiful and tasty creativity! So glad you found my blog, Michele! Thanks for commenting. I made this tonight subbing quinoa for the freekeh. And added some sautéed mini bell peppers. Delicious! This recipe is added to favorites. Would it work to use chopped almonds or is it best to buy the sliced ones? I have whole almonds in my cupboard that I could put through the food processor if that would work. I think chopping them would be just fine, Alicia! This is one of my new favourite recipes – it’s become a rotating regular on the menus at our house :) Thank you so much! Yummy! I added a pinch of ground chipotle to the cauliflower to spice it up! Also added some fresh chopped spinach to the salad, just because I didn’t feel like making an additional green veggie. I think it would’ve been great even without the tahini sauce! Great! I’m glad your version worked out so well, Angela. I had never even heard of freekeh, but I had to try it. I made this last night (with pecans as I’m allergic to almonds) and hubby and I loved it so much that it’s already GONE. I even ate some for breakfast too–yummy! I am going to try this with some different veggies. I loved how the tahini sauce looked rather unappetizing and separated until whisking turned it so smooth and velvety! I doubled the cumin and coriander since I love both and it was fabulous! Thank you for my new favorite! I have to say, we LOVED this recipe. I used quinoa instead and it was just fantastic so easy and quick to make. In my opinion it was delicious! I only wish I had cooked two heads of cauliflower as I love my veggies. My picky 12 year old said it was really really good and I can’t wait for my 82 year old mom to get home and try it! I will definitely make this again and the only changes I will make will be to increase the amount of cauliflower and maybe omit the salt as I have high blood pressure. Thank you, Christina for giving one of my recipes a try! I am happy it made the cut for your husband and your 12-year-old. I printed this out long ago when I had a bag of Freekeh to use up and somehow never got around to making it. I made it tonight with Farro. SO GOOD!! The only garnish I used was feta. I was never a big cauliflower fan but your recipes have changed that. Now I pick up two large heads a week! The soup from your book is amazing. As is the Roasted Cauliflower, Farro, and Arugula Salad with Lemony Tahini Dressing. I get a lot of questions in the staff room about my lunches and most of the time the answer is: Cookie and Kate!! Today a co-worker told me she asked for your book for Christmas! So happy to point people to amazing whole food recipes. Thanks Kate! This was sooooo yummy!! We had it with cous cous as couldn’t get hold of freekeh, and I was worried it might be dry but the cauliflower is so juicy and tasty. We ate this as part of ‘making more vegan choices’ and if all vegan food is as good as this, I’m sold. Love that! Thanks, Charlotte for your review. Delicious! Made the recipe with Kasha as I didn’t have freekeh, and it was amazing. I’ll do it again for sure! Fantastic recipe! I’ve never cooked with Freekeh before! Subbed in an onion and swapped almonds for cashews. It tastes delicious! Love the garlic tahini dressing too! Simple, tasty and wholesome! Thank you! Thanks, Stephanie for sharing how you made this your own. I really appreciate the review! Mmmm, I should have made this sooner it was so good. I could not find freekeh so I used farro. Don’t forget to add some raisins they were key. I wish there were leftovers both but we ate it all as a main dish. Did not use the feta to keep it vegan. I used one cup of farro and a medium cauliflower. Next time I will use larger portions as I was hoping to have leftovers for lunch. My husband said he wanted me to make this again and I’m happy to do so. Thank you! I’m glad you made it, Heather! Sounds like a great idea to make the portions go a little farther. Thanks for the review. I just made this. My husband and I loved it. My local store had freekeh, which I was shocked by! It’s definitely very filling, I felt full after half of my bowl. Like others have said, I’d increase the cauliflower and be extra generous with the red pepper flakes. Mine turned out slightly saltier than I would have liked–next time I’ll put less salt in the tahini. Thanks for sharing, Natalie. Yes, reduce the salt if you like. I appreciate the review! I was at the Bob’s Red Mill store in Portland last week and picked up a variety of ancient grains–this was my first time cooking with freekah and I am SO glad I chose your recipe. I made the recipe exactly (no feta) and it was AMAZING. Can’t wait to order more and make this again! Thank you for making freekah and garlic tahini sauce a staple in my home. You’re welcome, Hannah! Thanks for your review. Even though your recipe has been around a few years I only made it a few nights ago and just loved it. I was looking for a cauliflower recipe and since I recently also purchased a recipe book to support Syrian women, had the freekeh on hand. The leftovers were just as good the next day. Definitely going to make this again. Thanks Kate! Thank you for trying the recipe and for your review, Cynthia! I appreciate it. This is the tastiest new meal I’ve made in a very long time! Oh my goodness I can’t even tell you how much I loved it! Made exactly according to the recipe (except no raisins). 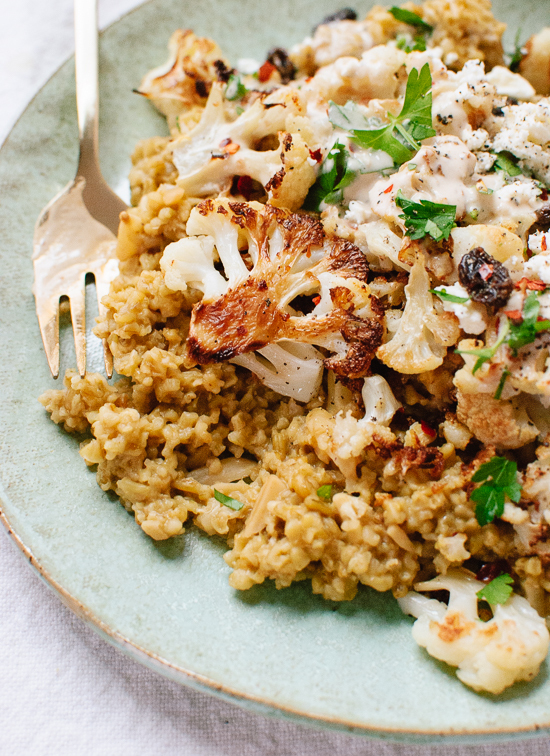 The combination of the freekeh, the cauliflower and the tahini dressing is amazing. I will be making this often. Thanks for the recipe! I’m so happy you loved this one, Dom! Thanks so much for sharing. I work at a grains stand at our farmers market and every month I try a new grain. This freekah recipe is a real standout ! I took it to a huge covered dish party ( 200 people) at my gym. Everybody loved it and the trainers all stole the recipe; there were no leftovers. However I saved out a portion, back at home, because I followed the directions to assemble it just before serving. Truly the leftovers are as good if not better than the first serving! I got my tahini from the MiddleEastern stand next to our grains. All in all i am eager to try the recipe with our black barley and other grains. I took a nice photo but I dont have Instagram. Its on my facebook page, where it got notice too. I am gifting the recipe along with a pretty container of frekeah to my most discriminating culinary friends and relatives. That’s so great to hear, Roberta! Thanks for sharing Cookie + Kate with your customers! I appreciate your comment and review. That was a really nice recipe and easy to make. I didn’t find freekeh on its own but found a mix of freekeh, lentils and beans and it turned delicious!